When it comes to facial procedures, most people are interested in finding the option that will provide the most significant benefit while also being the least invasive. Unfortunately, these two desires do not always go hand-in-hand. Nowadays, surgeons and cosmetic specialists offer several alternative approaches to traditional facelift surgery, from laser treatments to varying surgical techniques. While all of these procedures have benefits, they are not always viable substitutes for a facelift. Fortunately, Dr. Calabria has developed his own variations that achieve what is often so tricky: drastic facial improvement through a minimally-invasive approach. The traditional facelift targets aging on the mid and lower regions of the face and neck by making an incision starting from the hairline near the temples, around the ear, and ending behind the ear. Loose skin is trimmed, and the underlying tissues are pulled horizontally to smooth facial lines and wrinkles. Dr. Calabria finds that the traditional approach is overly invasive and leads to unnatural-looking results. Instead, he offers alternative techniques like the one stitch facelift. The one stitch facelift targets mild to moderate laxity on the lower half of the face. A small incision is made near the sideburn, the skin and tissues are pulled vertically, and a single suture is made to hold the lift in place. Unlike the recovery period for the traditional facelift, the one stitch facelift allows the patient to return to their daily routines immediately—you are even allowed to drive yourself home because the procedure does not involve general anesthesia or sedation. Your results will be natural but also noticeable. The thread lift has become something of a “rage” procedure in recent years. This technique is similar to a one stitch facelift, in that it pulls the skin and tissues upward through the insertion of a thread and not through the removal of skin. Although the theories behind the thread lift and the one stitch facelift are similar, the one stitch facelift allows for the skin to be used as an anchor to hold the tissues in place. This practice provides longer-lasting, more natural-looking results. The one stitch facelift uses minimally-invasive techniques ideal for patients with mild to moderate signs of aging. For a better idea of possible results, Dr. Calabria suggests that you place your fingers at your temples and gently push up. The lift you see in your skin is similar to what is possible with a one stitch facelift. If you are happy with the look you see in the mirror and are in good physical health with good skin elasticity, you may be a candidate for the one stitch facelift. For more information about Dr. Calabria’s one stitch facelift, or any of his facelift variations, contact his office by calling (760) 836-0077 or by filling out the online contact form. 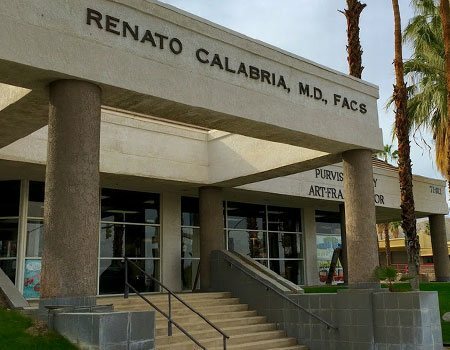 Dr. Calabria is a board-certified facial plastic surgeon practicing in Rancho Mirage.